A seedbox is a server where you can download and upload torrents. All of this happens by the use of a webinterface. Immediately when the torrent is downloaded (which will go way faster than on your house’s connection) you can download it through FTP(S), HTTP(S) on your house computer. Of course all of this happens in complete anonymity and you don’t have any upload traffic at home. So this is also a great way to improve your seed ratio. We offer you the service of a dedicated or a shared seedbox server to make it easy and fast! We have experience with more than 10Gbps of data! So we have a fast network available for you. With most questions replied within one hour, you don't need to wait. Keep your (personal) data secure with us! We never give personal details to other parties. No wait time, we deliver in less then 2 minutes after payment. We have a large stock available. We do not keep records or logs. This for privacy reasons! You can cancel any time your product to stop the contract. You can pay with BitCoin, CreditCard, iDeal, Sofort, Bancontact, Western Union and Bank Transfer. When you pay for more then one month you get a reduction as a thank you. A dedicated seedbox offers you complete freedom and dedicated resources without compromises. Supported interfaces You can install QuickBox, TorrentCLOUD or one of the Linux Distributions (Debian, Ubuntu, CentOS) and configure everything like you want with SSH access. Reduction Get one month free with yearly payments. Reduced price if you pay for 3 or 6 months. Don't worry, you can switch between the interfaces for free in our control panel. A shared seedbox gives you at a cheap price a lot of performance, perfect for seeding torrents. We have a list of common questions, please check before order/support request. • We deliver dedicated services within 1 minute when on stock, otherwise within 24 hours (please check your spambox). Server - Install other sytem? Shared - Shared user problems? • When you want to cancel your services, you can do that up to 1 day before the new month! • Click once on the STOP(hand) button, now your service get closed right away. • You can canel your services up to 1 hour before the new month ! But keep in mind that we do not offer refunds, if you have issues please contact support. • Because we believe in our product and our support service we do not offer refunds. Contact us if you have issues, we can change your product any time to another product that fits your needs. • When there is an open invoice you will see a payment button for different payment methods. TorrentFLUX - Change to TorrentCLOUD? • Click on the edit button to change your shared account (once per 24 hours). But please stop all torrents. TorrentFLUX - Download a torrent? • Use the "Get Url" function on the "homepage"
• Or use the "File Upload" function on the "homepage"
• After this, press "start" (green arrow) on the "homepage"
TorrentFLUX - Delete a torrent and files? • Stop the torrent (red arrow) on the "homepage"
TorrentFLUX - Seed a recently downloaded torrent? • Go to the "homepage" and press the blue arrow: "Start Seeding"
• Fill in the information you want and press once the "run button"
TorrentFLUX - Seed your own torrent? • Go in torrentflux to your "directory" and click on the "lego brick"
TorrentFLUX Dedicated - Transmission - Connect with a Windows program? 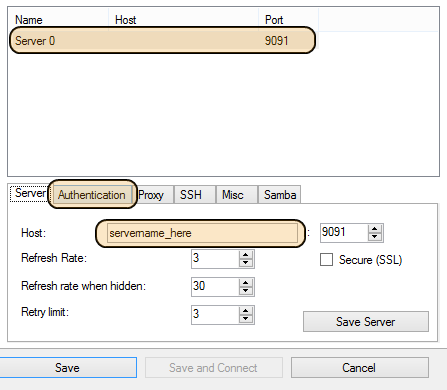 • Go to "Options" and then "Local settings"
• Go to the "Server settings"-tab and press "Add Server"
• Press now "Save and Connect"
TorrentCLOUD - Change to TorrentFLUX? TorrentCLOUD - Download/seed a torrent? • Use the "Url" or "Magnet" or "File" function on the "TorrentCLOUDpanel"
• After this, press "Run" and your torrent will start, this will automatically seed a torrent until you stop it! TorrentCLOUD - Download files from a torrent (HTTP(s))? 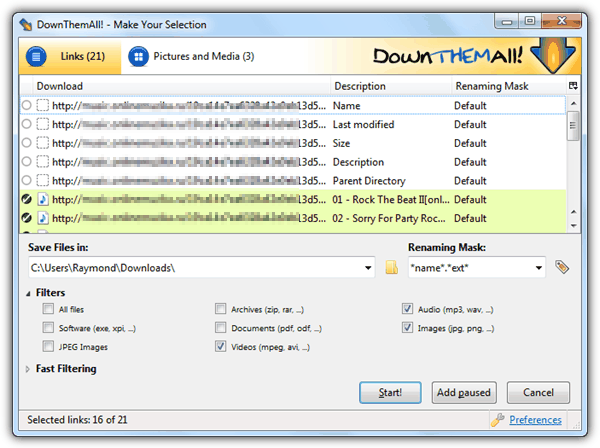 • Use a HTTP download tool like DownThemAll, FlashGot in firefox or chrome and use the right mouse button "download them all"
TorrentCLOUD - Download files from a torrent (FTP)? TorrentCLOUD - Enable HTTPS download? • Under "User Management" enable Link URL to "secure"
TorrentCLOUD - Is there a browser plugin?